Well, I missed the deadline for the December Roving Report, I had forgotten how much time and effort it takes to organize and then implement a Rally. The other thing I forgot is the connectivity, days without Wi-Fi or good Internet, which we take for granted in our daily life. 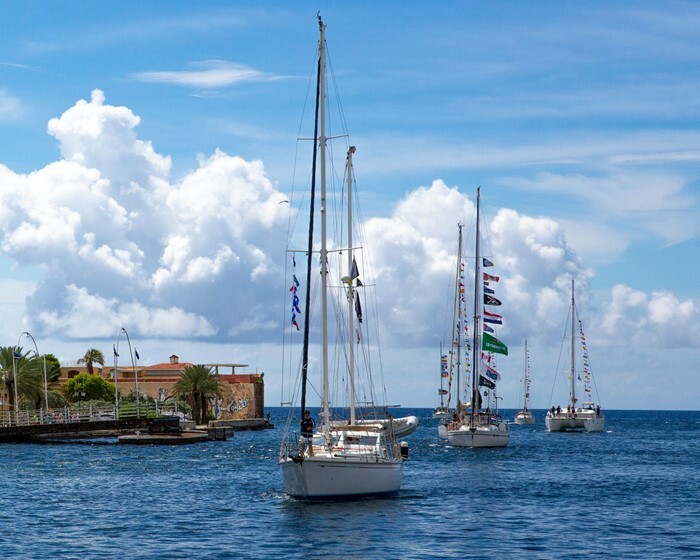 The Rally finally started with 64 boats and crew arriving in Curaçao in the Dutch West Indies at the beginning of November for the start of the second Suzie Too OCC Rally. I had been working hard with the Authorities, Ministers, Government, Navy, Coastguard, Marinas, Port Officers and Agents in all the countries we were to visit. This Rally is a very big thing for these countries as they have never had this number of boats visiting at the same time before; the previous Rally had 27 boats. Curaçao was our starting point. With 64 boats in Curaçao at one time, some local people worried how we would all find space to anchor, but it worked out amazingly well with lots of planning and help. One of my priority tasks was to make sure we did not make an impact on the environment, destinations and the anchorages while passing through these countries. It started by David and I giving a presentation to The Honourable Dr Steven Martinas the Minister on Curaçao and his team including my contact Raul Manotas from the Curacao Port Authorities. Also attending were Pierre Dormant from Customs and Mr Rojas Immigration, the Dock Master, David Maxfield Director from Santa Barbara Beach Hotel, and Marc and Harry from Curacao Marine. We presented the benefits and opportunities for the island to them as few of them were sailors. As you know when you sail you need provisions, food and wine, laundry services, taxis, car hire, hotels, bars, boat parts, sails, marinas, boat yards -- the list is long. This opened them up to our proposal that Curaçao could increase its profile within the sailing community for now and in the future. We highlighted to them that they sit under the hurricane belt and it was an opportune time to re-evaluate where people keep their boats, especially after Maria and Irma had damaged much of the Eastern Caribbean. They asked what was needed? So we explained that we needed an area for about 40 boats to anchor safely without restricting the local boats and cruisers, somewhere protected and safe with a dinghy dock. We were given an unused area in Spanish Water just for the Rally, they constructed a dinghy dock with lights, garbage collection, supplied a 24/7 security guard and a Palapa so we had a meeting point. How fantastic! Curaçao Marine, gave everyone an excellent haul out service, sponsored our Rally tee-shirts, and also hosted our first ever get together. Santa Barbara Golf Hotel and Spa Resort gave us the use of their hotel, beach area, extra docking and a venue to hold our presentation and meetings; it all came together perfectly. The Rally had a home to start the beginning of our 5.5 month trip, with 9 nationalities and a wide variety of boats from 38 ft to 60 ft both monohulls and catamarans. The week before the start date, we organized events such as a quiz night, wine tasting, a ladies’ day out and the famous Suzie Too Sunday on the nearest beach. It was a way of introducing everyone to each other slowly; it wasn’t so bad for me as I had been communicating with all the 134 people for months before, so I was one step ahead of everyone. It was a challenge for the rally members learning everyone’s names and boat names. The days flew by, doing last minute boat jobs which you never seem to get to the end of. It was critical to get the big jobs done here and the boat fully working. The destinations on our route offer very limited facilities and getting boat parts and specialist knowledge is just harder, costly, and time consuming. The cost also rises, as you pay clearance fees, taxes and carriage. David calls this Stupidity Tax, as we should have bought the parts before and had spares with us instead of having to source and ship to Colombia, Panama or Honduras! We had many get-togethers and people enjoyed their time getting to know each other. They started to share knowledge, expertise and help which was an excellent sign so early on in the Rally. Santa Barbara Resort hosted our main event in their beautiful conference rooms, free of charge, so a big thank you to David Maxfield and his team. David and I presented the Rally and introduced ourselves, the route, typical weather, passage planning, the Rally ethos, and the places we were visiting in more detail. Then what to buy and stock up on, where to find things, a whole range of topics were discussed. We had invited guest speakers. Juanjo Boschetti the Manager from Shelter Bay Marina in Panama and the owner Gabriel Dutari came and presented their facilities and shared all we had planned for them when we paused after the first leg of the Rally. The Customs and Immigration team on Curaçao met us on the morning of departure at Santa Barbara Beach hotel, so we all checked out together without having to move our boats out of the anchorage. Thank you for this amazing service. Once all checked out and passports stamped, the reality hit: there was no turning back, we were off. The weather was perfect and Group 1 of 44 boats left Spanish Water to make our way down to an anchorage in Santa Cruz at the end of the island so we didn’t have to do a night passage. Aruba was the next stop 90 miles away. We grouped boats of the same sailing speed together so we would have safety in numbers and company while we sailed in these different waters. The adventure had started and I have to say it has been a truly amazing experience so far. A VHF net at 8.15 am every morning kept us all on our toes. We gave out the weather and local information and events for our social calendar, a great way to share the information. Also, an SSB net was set up for the longer passages and, with that all organised, we set off for Aruba. Aruba is not the friendliest of docks or check in, and unfortunately the day we arrived their computers had gone down. Everything took a long time. The docks are the cruise docks which are very yacht unfriendly, but I weaved my magic on the authorities so we had an easier check out from the anchorage when we needed to leave. I am writing this piece while sailing from Guanaja in the Honduras Bay Islands moving to Roatan. We have only 26 more days left of the Rally and I have so much more to write about in my next piece but I will leave you with this message. I will be very sad when this Rally is over, the people on this Rally and the people and places we have met and visited on the way wriggle their way into your heart. Colombia is one of my favorite countries by far, happy smiling faces with an amazing outlook on life, their vibrant cities, decorated walls, their hospitality is warming. It’s a big recommendation from David and me on Suzie Too that you visit this country. It’s coming out of darker times and its starting to thrive. Be part of that and celebrate in their future with them. For more photos, please visit the Suzie Too OCC Rally gallery on this website. Follow the link below.